Egg & Dart Chest. Handmade furniture. High end furniture. Custom furniture. Egg & dart is an ornamental device often carved in wood, stone, or plaster quarter-round ovolo mouldings, consisting of an egg-shaped object alternating with an element shaped like an arrow, anchor, or dart. Egg & dart enrichment of the ovolo molding of the Ionic capital is found in ancient Greek architecture at the Erechtheion. It was also widely used by the ancient Romans. The motif has also been common in neoclassical architecture. Award-winning designer Shah Gilani, ASFD, was inspired by this motif while designing this exquisite chest. 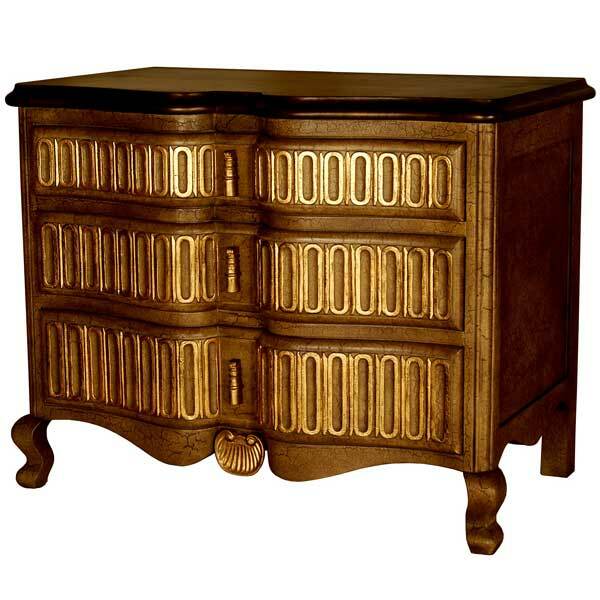 He married a classic English style cabinet with the ancient egg & dart embellishment. Entirely hand-carved in selected rosewood, the Egg & Dart Chest is offered in a variety of finishes and accents. It is available in several standard sizes. The smaller size makes an exceptional night stand, while the larger size can be used as a dresser or an accent piece.